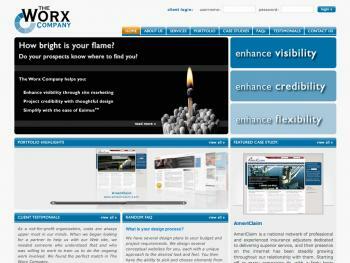 The Worx Company is an Oklahoma-based Drupal design and development firm. Having used Drupal for the last two years, The Worx Company re-developed their own website in Drupal to leverage it against the needs of their customers internally and externally. The Worx Company website functions in a number of different capacities. Previous versions have allowed customers to log in to see the design work The Worx Company has produced for them before the website is implemented. Planned future development includes integration of the internal Project Management System so that customers can log into the website to view the status of all their projects and tasks. Additional points of interest include the fact that all the flash on the website (with the exception of the small flash header on most pages) is controlled with Drupal. Primarily this would be the front page flash and the portfolio flash. All instances of the Portfolio flash (both on the front page and on the portfolio page) are dynamically controlled by the Drupal administration system.